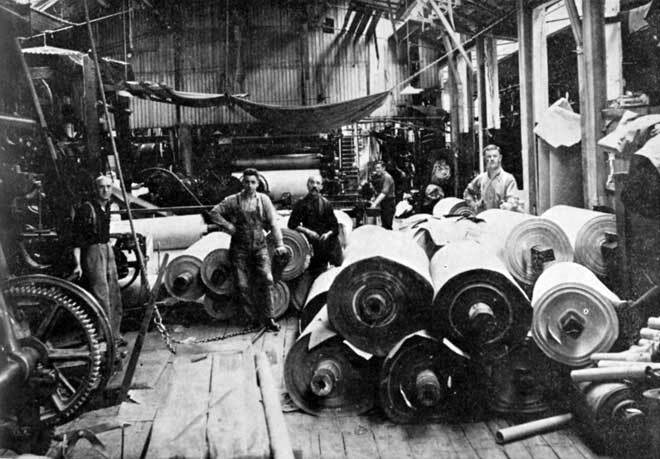 Papermakers at the Mataura mill stand around reels of paper ready to go to the finishing department. In the 1890s the mill employed approximately 60 people. Conditions were primitive and wages low. The best-paid were machine men, who received £2 10s. for a 66-hour week. At the other end of the scale were mill labourers, who were paid six shillings a day. There was no job security, and temporary layoffs occurred from time to time, caused by a shortage of raw material, the river level dropping, or slowing orders for paper.